SEATTLE, WA -- Seth Smith powered Seattle past Houston and put the Mariners closer in the wild card chase. He hit a pair of home runs and drove in four runs on Sunday to help the Mariners beat the Houston Astros 7-3. His effort backed up a strong performance by lefty Ariel Miranda as the Mariners remained in the thick of the congested wild-card race. The Mariners (79-70) are one game behind Toronto, which holds the second wild-card spot. Smith had a solo shot in the third and a three-run shot in the fourth, both on 3-1 pitches from Doug Fister (12-12). Smith had been 0-for-10 in his career against Fister but the eight-year veteran had a plan. "Guys know what they're doing when they are pitching and able to pitch to the corners," Smith said. "You try to take the close ones, try to get into a good hitter's count when they come after you." Smith, who now has 16 home runs on the season -- one short of his career high -- was patient enough to work both into hitter's counts then connected on fastballs into the right-field seats. "You're constantly learning, how to approach at-bats, knowing what kind of swing you have going into a game, knowing what the pitcher is trying to do to you," Smith said. "Over the course of a career you kind of fit the pieces a little better together." Fister said, "I was just trying to attack with my sinker; he put a couple good swings on balls -- clearly. "I just didn't execute today, that's what it comes down to. Balls down, balls up, all over the place. I let my team down." Miranda (5-1), acquired in a trade with Baltimore on July 31 for lefty Wade Miley, went seven innings -- his longest outing in 10 starts with Seattle -- allowing two runs on three hits. He walked one and struck out eight. "Heck of an outing," Mariners manager Scott Servais said. "He's on a heck of a roll. We certainly needed it. He's gained so much confidence. You can certainly can see it." Miranda has won all four of his starts in September. The Cuban defector said, through an interpreter, "it's been a dream of mine (to be in a playoff chase) but never been there. It's really great to get there. I'm happy with the work I've been doing and happy to help the team." Houston manager A.J. Hinch said Miranda "has a good fastball and a good split-change thing that he throws. Our guys hadn't seen a ton of him. ..He did a good job challenging us, but just above the zone and we swung under today and hit a lot of pop-ups in the infield, a few balls to the outfield. A couple balls to the track that could have changed the game a little bit. He kept enticing us with fastballs." The Mariners have won nine of their last 11 games. With Jandel Gustave's strikeout of Shawn O'Malley in the sixth, the Astros staff established a club record for strikeouts with 1,283. They've done it without even a 200-strikeout pitcher. "For the most part we have a few guys who can spin their breaking balls when they need to," manager A.J. Hinch said. "and the changeup is a big component of our pitching staff." Nori Aoki, who was sent to the minors twice this season to work on his offense, has found his batting eye this month. Entering the game, he was hitting .387 in September, fifth best in the American League. He had been hitting .255 overall to start the month. For his career, he is a .324 hitting in September, fourth best among active players. He had two hits Sunday. Mariners: 1B Adam Lind had not played since Sept. 12 with a sprained finger in his right hand but was back in the lineup Sunday, missing five games. Astros: RHP Brad Peacock (0-0, 2.70) will make his third start, seventh appearance, in his effort to win his first game since 2014. Last time ou, Sept. 13, he was solid, going six innings and allowing just three hits and one run in a 3-2 loss to Texas. 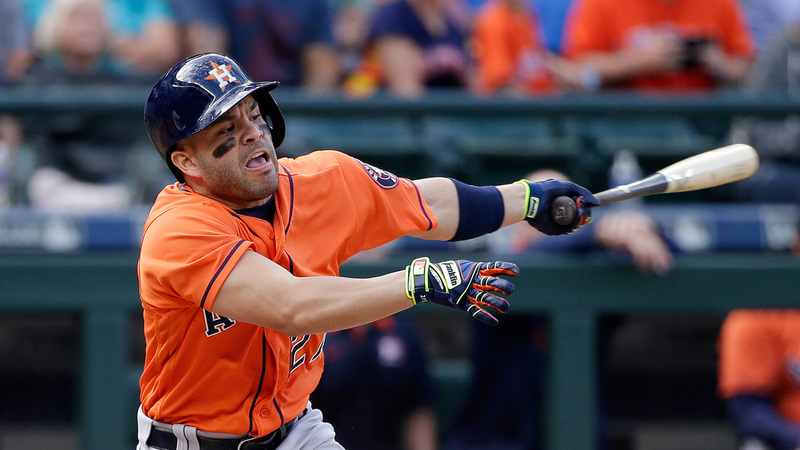 Now the Astros are counting on him to step up at the most critical stage of the season. He is 1-4 with a 4.97 ERA in nine career appearances against Oakland. Mariners: RHP Taijuan Walker (6-10, 4.28) is coming off his best starting effort of his career (59 starts). He allowed just three hits and no runs -- first career shutout -- in an 8-0 win over the L.A. Angels. He had a no-hitter through 5 2/3 innings. He is 0-2 with a 3.66 ERA in three career starts against the Blue Jays but has not faced them this season.